Figuring out how to scale a recipe can be a challenge. Not anymore! 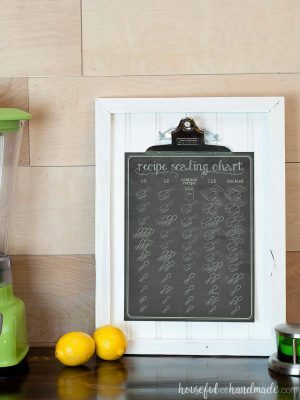 This printable recipe scaling chart will help you keep track of your new measurements while also being artwork for your kitchen. If you like to half, double, or scale your recipes in any other way, you know that some measurements can be hard to figure out. Especially when you are working with 2/3rds or 3/4ths. 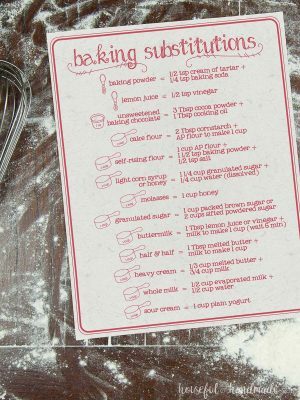 And of course, doubling a recipe is usually pretty easy, but what if you don’t need quite that much? What if you want to one plus 1/2 of the recipe? 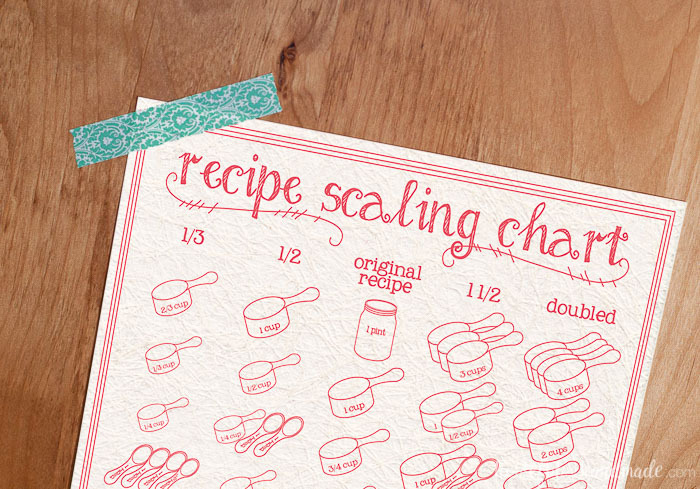 This printable recipe scaling chart is here to help! Now you can easily scale a recipe by 1/3, 1/2, 1 1/2 or double. Since I am in total kitchen mode right now, trying to finalize all the details of our upcoming kitchen remodel (you can see a sneak peek of the design in the printable kitchen planning tools post), I figured it’s a great time to add a third kitchen helper chart to the mix. 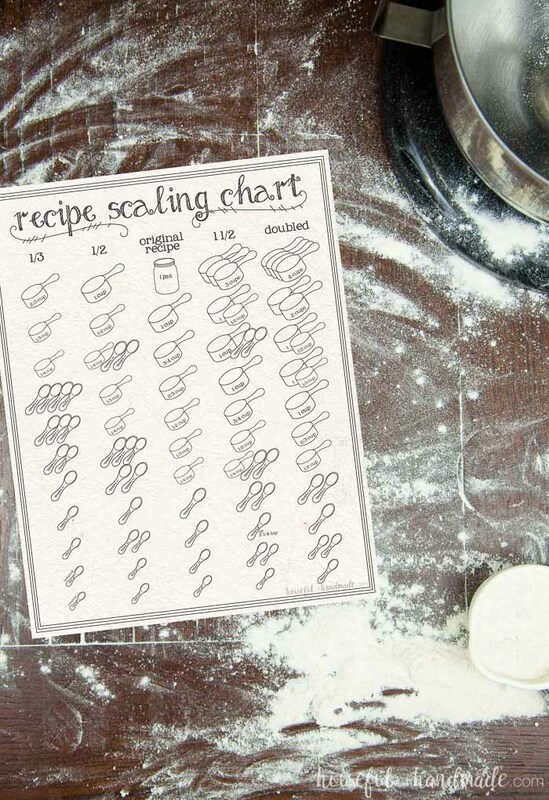 You guys were asking for another kitchen printable to match the Kitchen Conversion Chart and Baking Substitutions Chart and here it is: a Recipe Scaling Chart. I am notorious for always changing up recipes. For some reason I cannot just follow a recipe as written. I think it has something to do with my crazy, creativity brain. And whenever I need more or less of something, I never want just double or half. No that would be easy! I want to make 1 + 1/2 of a recipe. Or only 1/3. But sometimes figuring out those measurements can be a big pain. So I spent some time this week, with lots of help from Google trying to refresh my knowledge of fractions, figuring out how to scale recipes to these different options. Then I made this cute little chart to print and put in the kitchen so I can promptly forget all that fraction information! 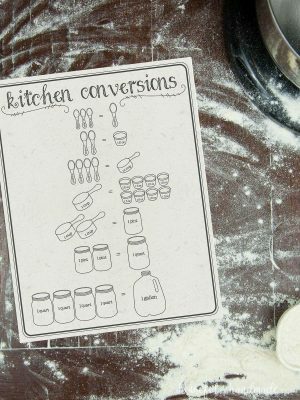 The best part, I made this chart to exactly match the Kitchen Conversion Chart and Baking Substitutions Chart. All three charts come in 4 different color ways (two chalkboard and two vintage paper). So you can now have a cute little grouping of 3 kitchen helpers as an art wall in your kitchen. Or print them out to give with a bridal shower gift of your favorite kitchen tools. 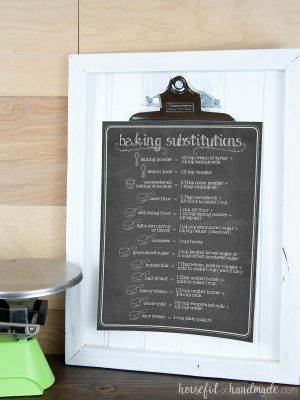 And hopefully they will come in helpful when you are getting creative in the kitchen too! The printable kitchen charts were free to my subscribers until 11/18/2018. Now they are available to purchase in the shop. Make sure to subscribe so you will be notified of new freebies! Now it’s time to do some more work on the kitchen planning! 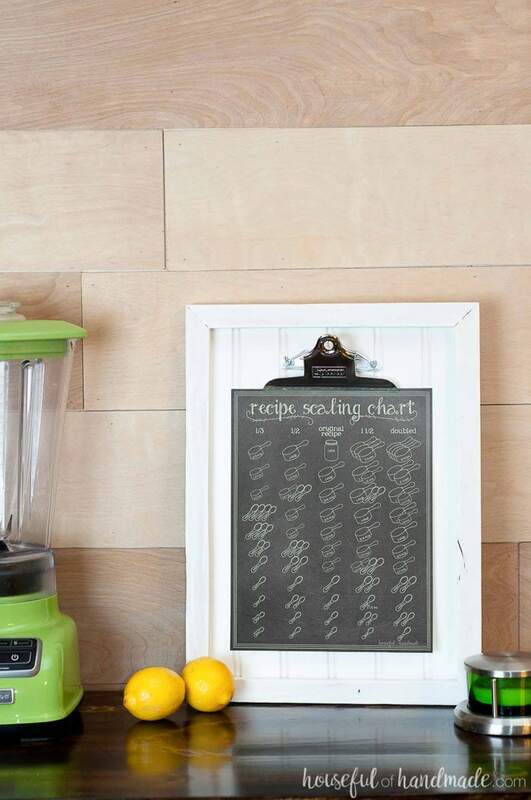 Love the recipe scaling chart and definitely need to print it. It will be a big help to me. But…I can’t find the link to print it in your posting. Please help me. Thanks! All the printables are in my subscriber library. Once you subscribe, you will get an email with the link and password. Then just scroll through the library (it is a bit large) and find the printables you want. If you click the links below the pictures you will download them. Hope this helps Patty, if not, feel free to email me and I can assist more!